Michael Jai White plays Bone, an enigmatic ex-con who rises quickly through the ranks of L.A.’s underground fight scene. 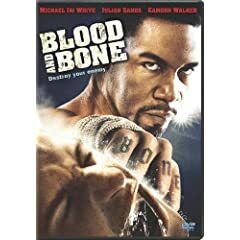 At first it seems Bone only wants to land a fight with the local champ, Hammerman (Bob Sapp), and attract the attention of mob boss James (Eamonn Walker). However, as the film unfolds, we learn of Bone’s promise to look after his cellmate Danny’s wife and son. Danny’s wife, Angela, happens to be indentured to James, addicted to heroin, and unaware if her son is even alive. Meanwhile James is looking to prove himself to an organization called the Consortium, represented by arms dealer Franklin McVeigh (Julian Sands). Leading man and producer White and writer Michael Andrews have extensive martial arts training, and the film features many real-life MMA fighters, lending it low-tech authenticity. At the same time, White, Walker, and many of the supporting players have the acting chops to lend their characters depth. Definitely worth watching. The DVD includes a behind-the-scenes featurette and an audio commentary with actors Michael Jai White, Dante Basco, and Michelle Bellegrin, director of photography Roy H. Wagner, and director Ben Ramsey.